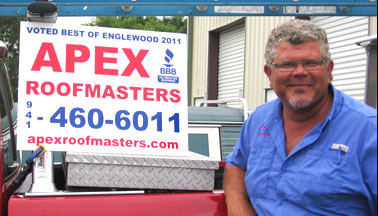 Apex Roofmasters is a family run company with over 20 years of experience in the roofing trade. We are committed to customer satisfaction on every job we complete. 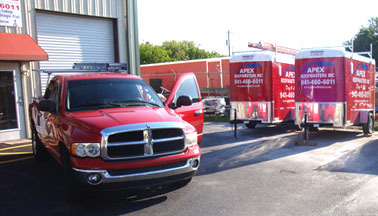 Apex Roofmasters is a locally owned and operated company servicing SW Florida from Englewood to Sarasota Counties. David L. Appelo, Sr, has been in the industry since 1989. He personally inspects every job, and is happy to answer any questions or concerns you may have regarding your roofing needs. A GOOD Reputation Is the lifeblood of Apex Roofmasters. We were honored by being voted "Subcontractor of the Year 2014" by the C.D.B.I.A. We offer our thanks to all who voted and supported Apex Roofmasters! Our trust and honest work ethic are as good as our name. Professionalism and quality work are the focus of our company. We know that these qualities will ensure growth and expansion for Apex Roofmasters for generations to come. "Under Promise and Over Perform"
Our roof work will keep you dry for LIFE! As part of our work ethic, you will be informed every step of the way during the roofing process. Total project satisfaction is how Apex earns and grows our good reputation. The job is not complete until you are completely satisfied with the results of your home improvement. We continue to fill a vacuum of integrity in the roofing industry. Our growth is dependent on each and every project Apex encounters. 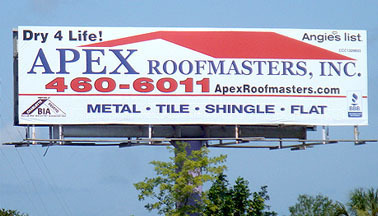 The Apex Roofmasters, Inc. Team! APEX Roof Masters, Inc. Copyright 2013 All Rights Reserved. Web Hosting by Yahoo.